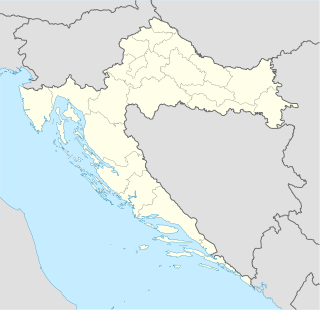 The 2018–19 Croatian First Football League (officially Hrvatski telekom Prva liga for sponsorship reasons) is the 28th season of the Croatian First Football League, the national championship for men's association football teams in Croatia, since its establishment in 1992. The season started on 27 July 2018 and is expected to end on 25 May 2019. The league is contested by 10 teams. On 23 April 2018, Croatian Football Federation announced that the first stage of licensing procedure for 2018–19 season was complete. For the 2018–19 Prva HNL, only eight clubs were issued a top level license: Dinamo Zagreb, Gorica, Hajduk Split, Inter Zaprešić, Lokomotiva, Osijek, Rijeka and Slaven Belupo. All of these clubs except Gorica were also issued a license for participating in UEFA competitions. In the second stage of licensing, clubs that were not licensed in the first stage can appeal on the decision. 1 Lokomotiva and Rudeš host their home matches at Stadion Kranjčevićeva as their own ground failed to get license for top level football. The stadium is originally the home ground of third-level side NK Zagreb. Each team plays home-and-away against every other team in the league twice, for a total of 36 matches each played. ^ "Središnji postupak licenciranja za natjecateljsku 2018/19. godinu za UEFA klupska natjecanja, Prvu HNL i u Drugu HNL završen u prvom stupnju" (PDF). hns-cff.hr (in Croatian). 23 April 2018. Retrieved 7 May 2018. ^ a b "Stadion Maksimir". prvahnl.hr. Retrieved 6 July 2018. ^ "Stadion Poljud". prvahnl.hr. Retrieved 6 July 2018. ^ "Stadion ŠRC Zaprešić". prvahnl.hr. Retrieved 6 July 2018. ^ "Stadion Aldo Drosina". prvahnl.hr. Retrieved 6 July 2018. ^ a b "Stadion Kranjčevićeva". prvahnl.hr. Retrieved 6 July 2018. ^ "Stadion Gradski vrt". prvahnl.hr. Retrieved 6 July 2018. ^ "Stadion HNK Rijeka". prvahnl.hr. Retrieved 6 July 2018. ^ "Stadion Ivan Kušek-Apaš". prvahnl.hr. Retrieved 6 July 2018. ^ "Propozicije natjecanja za prvenstvo Hrvatski Telekom Prve lige za natjecateljsku godinu 2018/2019" (PDF). hns-cff.hr (in Croatian). 18 July 2018. Retrieved 27 July 2018.